Chairman of NCFJE Rabbi Shea Hecht released a statement following the successful conclusion of the holiday of Yom Kippur thanking the community and the sponsors of Kappores. 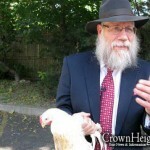 He also apologized for the delay of the delivery of the chickens on Erev Yom Kippur. It’s now forty years that the NCFJE has assisted the Jewish community in observing the ancient and holy minhag of kapparos. It’s well known that my father, Rabbi Yaakov Yehuda Hecht, OBM, received the Rebbe’s blessings and enthusiastic support in reviving this custom, and the Rebbe would frequently ask my father about the details of the operations, costs, and even about those in attendance. As always, the committee and I want to express our deepest gratitude to our sponsors, who have never failed to support kapparos and ensure that families should be able to observe the minhag without facing crushing expenses. We also want to thank the Crown Heights community for turning out in full force. This year, for the first time in recent memory, we experienced such a huge demand for subsidized kapparos that we actually ran out of birds very quickly. We’ll be taking steps to ensure that there will be ample supply of subsidized birds next year. We also deeply regret that the delivery of birds on Erev Yom Kippur was delayed by several hours. This was an act of Heaven and couldn’t have been foreseen or prevented. Many families were forced to go elsewhere for kapparos, which is understandable. In the future we hope put an emphasis on earlier venues so that there will be less of a risk of last minute mishaps. I also thank the community for being cautious and sensible about their personal conduct. A certain hostile organization is continuing to take legal actions to try to abolish this aspect of our religion, and the dignified, mindful conduct of the community does a lot to dispel their claims. Many members of the community have come forth with ideas and suggestions to make kapparos run more smoothly and efficiently. Anyone who wishes may contact us at kaporos@ncfje.org. To clarify for those who have expressed their concerns: NCFJE uses each and every kapparos chicken for kosher purposes. Even the treifos do not go to waste, as they, their feathers and entrails are recycled by an outside company. On behalf of the directors and trustees of the NCFJE I would like to wish you all the very best of the coming year. Thank You Rabbi Hecht for making Kaporas monhag Jewish tradition to take place again. I came all the way from Long Island to do Kaporas. No they weren’t. I was there, no one asked you your marital status and the prices were posted. Thank you for fighting the good fight!!! 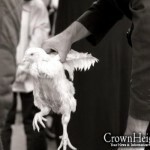 If you have nothing nice to say….say nothing….and definitely don’t make up stuff…..chickens were clearly priced. Thank you NCFJE and rabbis hecht for a job well done…..The Aibishter really runs the show…although we think we do…..all your planning and hard work was appreciated the rest is up to…. Much continued Hatzlocha in all your work! shea hecht keeping it classy. well done. Thanks for taking care of this year in year out no matter the cost and circumstances,. Thank you for all you do for our community. The things that people know about and the things that that people don’t know. I like an honest man like shea hecht who comes out and says it like it is.